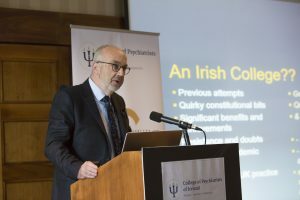 A milestone annual Spring conference marking the 10th year anniversary of the College took place from 3rd –5th April in Dublin. Themed ‘Looking Back, Moving Forward’, the three – day programme was packed full with internationally renowned speakers (domestic and international) and an eclectic range of parallel sessions. 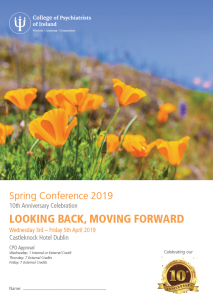 This year’s Spring Conference was an opportunity to reflect on the success of the College and acknowledge the support and many hours of input and work provided by our membership over the last decade. At Thursday morning’s opening session, Chief Executive, Ms Miriam Silke, welcomed delegates 350 delegates , provided an introduction to the conference and shared some highlights of the College achievements from the past ten years. Dr Justin Brophy, Prof Greg Swanwick and President, Dr John Hillery spoke about the various elements of the vision for the College, the achievements in postgraduate training and building for the future vision of the College and psychiatry. 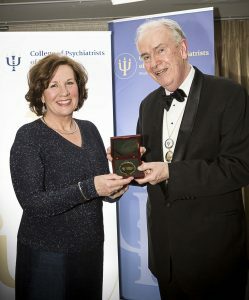 A video presentation was played to delegates which highlighted the many achievements and milestones reached since the College was formally established as an Irish only professional body for psychiatrists in January 2009. Dr Peter Byrne spoke on Premature Mortality in Severe Mental Illness and Prof Mary Cannon chaired a session about Youth Mental Health, as a global challenge. Prof Pat McGorry, professor of Youth Mental Health at the University of Melbourne and Executive Director of Orygen, Australia initiated the session presenting trends, movements and up to date approaches to youth mental health and illness globally with the key message that any policy, service, early intervention and support needs to begin as early as needed but crucially continue through to young adulthood and not discontinue at age 18. 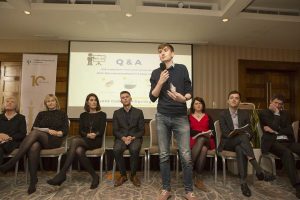 A panel discussion followed facilitated by Dr Michele Hill, Dr Helen Keeley, Dr Josen McGrane, Dr Eric Roche, Prof Barbara Dooley, Mr Neil Mac Dhonnagáin, Dr Emmet power, Ms Helen Coughlan, Dr Kate Irvine, and Ms Jeannine Webster. 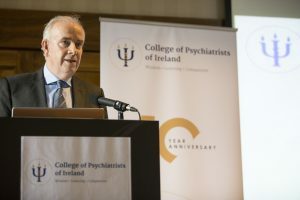 The parallel sessions at this year’s Spring Conference provided many interesting topics including the Irish Psychosis Network, Communications and media training, Personality Disorders Special Interest Group, Professional Competence, the Irish Healthcare System, Perinatal Psychiatry, and Patient Safety Disclosure. On the occasion of the College 10th Anniversary, Council approved the awarding of Honorary Fellowships and Fellowships and held it’s first Fellowship Ceremony on Thursday evening, honouring those who contributed to the founding of the College and its success over the years. The College Choir, ‘Musically Minded’, performed at the opening of the awards ceremony which was followed by a black tie gala celebration dinner. Friday morning’s plenary addressed the topic of Autism Spectrum Disorder. 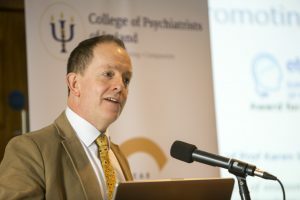 Mr Adam Harris, founder and CEO of AsIAM,was a keynote speaker with lived experience of ASD who reflected on the barriers which presently exist for autistic people in need of mental health support in Ireland, outlining practical steps can be taken in mental health services to reduce the often anxiety inducing experiences of someone with ASD attending services. AsIam website has many resources of help and particular suggested sensory tools to enable services to be more ASD ‘friendly’. Dr Marc Woodbury-Smith discussed ASD and its comorbidities in adulthood. Prof Louise Gallagher later spoke about new discoveries in the biological underpinnings of autism and the development of new therapies and how this further challenges clinical practice. 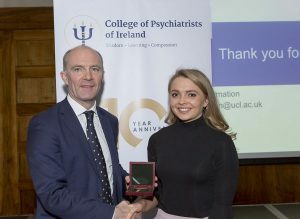 In the afternoon, the CPsychI prizegiving ceremony took place where the winners of the John Dunne Medal, Ada English Medal and Best Poster were announced. Friday’s sessions ended with presentations and interesting discussions about ‘Cannabis and Psychiatry’. Prof Sir Robin Murray, Dr Marta Di Forti and Dr Matthew Sadlier were the keynote speakers. Members can view the College photo gallery here.